There are times when your garage door will stop operating for one reason or another. When this happens, you need to make the decision whether to replace or repair your door. Choosing between these two options might be tough, especially if you are on a tight budget. However, there are signs that indicate that a replacement might be a better choice than repair or vice versa. When Should You Opt for a Door Replacement? One of the most common reasons to opt for a door replacement is to improve the aesthetic value of your home. If your door appears scratched, rusted, warped, cracked, or old, then it may be the best time to replace it with a new one. You can choose from several door types and styles. Once replaced, your garage will have a new look. Another reason that warrants a door replacement is physical damage. Damages can come in the form of dents, cracks and signs of wear and tear on any component of the unit. These damages can also render the door worthless, as damaged or broken doors do not always operate smoothly. When these things are observed, you need to replace the door. When Should You Repair Your Door? A repair may be necessary if your door simply stops working. 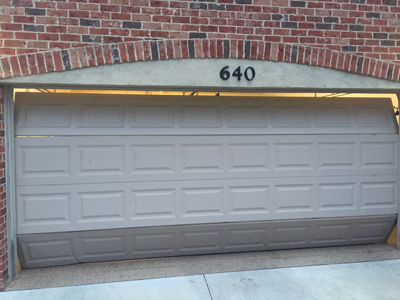 An expert can typically diagnose the problem with the garage door and repair it. This way, the door will work again in no time. When the door feels heavy, then it may be time to repair it. In fact, this is another common reason for garage door repair. This happens when the door is out of balance. Components that affect the door’s balance can easily be corrected. Panel damages may be another factor that calls for door repair. This can be easily performed and completed. If one or two panels are affected, these parts can be repaired. Once completed, the door will appear new and undamaged.